Sound familiar? A key aspect of Society 3.0 involves online open access, crowd sourcing that promotes sharing, remixing, and capitalizing on new ideas. We know that much of this happens through online communities — where knowmads gather in virtual spaces to push ideas into reality. 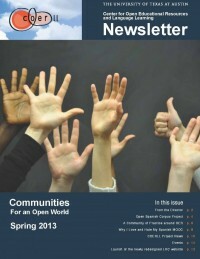 In COERLL’s Spring 2013 newsletter, we share what we’re doing to nurture Society 3.0’s language communities. First, we’re launching eComma, a web application and resources for social reading — where groups of users annotate the same text together. Also, COERLL’s SpinTX Corpus-to-Classroom Project aims to create a self-sustaining community of linguists, technologists, and Spanish language educations collaborating on a video-based website for teaching Spanish. And check out the facebook language communities we moderate: COERLL, Francais interactif, Deutisch im Blick, Brazilpod, Spanish in Texas. Finally, this. Us. Here. At Open Up, we want to connect with other language learning knowmads looking for ways to accelerate change toward open education. So please get in touch with us with your ideas for sharing, remixing, and capitalizing on open language resources. Join the conversation! For more about fostering language learning communities, see MOOCs + Learning Networks = The Mixxer by Todd Bryant. << Previous PostGive Us Some Credit!